Fifteen members of the Class of 2016 will continue their athletic careers at the collegiate level next year. These recent graduates will represent nine sports at 14 campuses throughout the US. Among the group, three athletes will be joining Division I programs. During their time at Gill St. Bernard’s, these Knights helped their teams compete at the county, regional and state level. 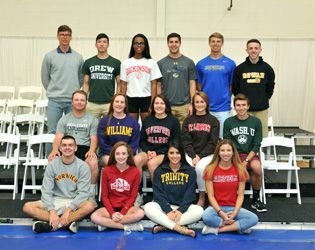 Congratulations and best of luck to our athletes as they join their college and university teams next season.